Alex Steen, Jason Arnott, Alex Pietrangelo and Patrik Berglund scored third-period goals, as the Blues battled back to beat the Columbus Blue Jackets 6-4 at Scottrade Center. 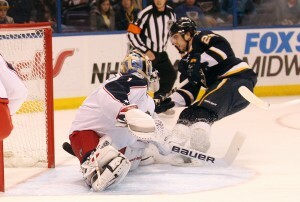 The Blues also got a goal and an assist from T.J. Oshie, while Kevin Shattenkirk and Patrik Berglund added goals. Jaroslav Halak stopped 28 shots, and the Blues improved to 5-0-1 in their last six games. They are now 2-6-1 in games trailing after two periods. David Backes, David Perron and Jamie Langenbrunner each had two assists. The Blues were in 14th place of 15 teams in the standings on November 7th and since then climbed to third overall in the Western Conference and to within four points on the Chicago Blackhawks who have won five straight.